The 2016 GARBC Conference has something to offer the whole family! Teens and children will enjoy Bible-centered programs designed especially for them. Mark your calendar for Tuesday, June 28—Friday, July 1 for the annual conference, graciously hosted by Harvest New Beginnings, Oswego, Illinois. Excellent main session speakers and relevant workshops will challenge and encourage you. The Chicagoland location makes a perfect conference and family vacation combination. Come and be spiritually and emotionally refreshed! “Better Man” is the theme for Northeast Fellowship Men’s Adventure to be held Feb. 9 and 10 at Central Baptist Church, Binghamton, New York. The event offers excellent challenges through main sessions with speaker Ken Rudolph and three workshop sessions. Good preaching, practical help, great fellowship, recreational sports activities, and good food mark this Northeast Fellowship ministry. Witness confidently. Park Lane Baptist Church, Omaha, Nebraska, is hosting EvanTell evangelism training Feb. 6, 9:00 a.m.–2:30 p.m. Share the gospel message! 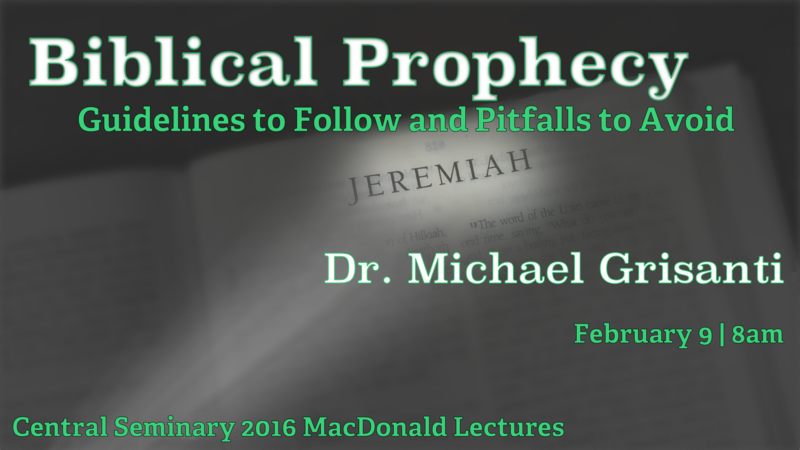 Central Seminary’s 2016 MacDonald Lectures will equip attendees to handle prophetic passages with integrity and confidence. Dr. Michael Grisanti, professor of Old Testament at The Master’s Seminary, will share his insight into interpreting prophecy from over 30 years of studying and teaching the Old Testament. Posted in e-INFO, February 2016, Improving Your Ministry Skills on February 2, 2016.